Back in February 2014, we asked that everyone be granted their daily bread, to sustain them in the life’s challenge. It was a simple request; and one quite capable of being fulfilled by man alone, with the great God-given knowledge that he possesses today. And yet, to our dismay we find that people are still living in poverty, are homeless and dying from starvation in a world where so few have so much; and the rest of us have to fight among ourselves for what remains. The poor people, for the sake of this intention, are those lacking the means of comfortable subsistence. Specifically, we refer to them, sometimes rather harshly, as beggars, indigents, destitutes. Sometimes, finding yourself without food, shelter, clothing and the means to provide these, can be self-inflicted, and arguably ‘fixed’ by self-adjustment. But, as is obvious from our daily ‘diet’ of woe through the media, man-made disasters such as war; and natural disasters such as earthquakes, tsunamis, pro-longed droughts and flooding create poverty-stricken families in their millions, annually. It is within our means as a world people, to take care of the poor. From our own travels not too far abroad, we have confirmed for ourselves an incredible over-production of fruit and vegetables, with many crops left hanging on bushes or ploughed back into the ground, unharvested, unused, uneaten. We have visited large shopping centres and weekly markets, and have been overwhelmed at the bales of clothes, cut open and scattered around stalls and counters for the rich and not so-rich to feed upon. Indeed, from our own family collections, we have donated several baskets of woven wares to suitable charities – at least we hope they reached the people they were intended for. Millions of ‘holiday’ and/or ‘second-homes’ lie idle for most of the year across the world. And, here in Ireland, houses – incomplete or otherwise – remain unoccupied, as the result of the excesses of the boom years up to 2008. But, for whatever complex reasons, governments appear incapable of coming together, either to prevent disaster; or to react quickly and effectively to repair the damage caused. There are many great organisations and individuals, trying to breach the gaps caused by policy, politics, economics and red tape. Governments do support these, but they have to turn to the ordinary people in times of crises. Has there ever been as great a number of appeals by charity and other organisations on our screens this Christmas, as on previous occasions? And it does not help, that some of the best-known charities – at least in this country – have been tainted by accusations of fraud and gross over-payment of executive salaries. Pushing down on all the foregoing reasons, there appears to be an embedded or underlying issue which might partly or wholly explain why the ration of cake or loaf of bread for the poor and the ‘rest of us’ is reducing in size each year. It is referred to as wealth inequality. Wealth has many definitions. It is often said that “your health is your wealth”. This is correct to a great degree, for without good health, it is difficult to enjoy both the simple and finer things in life. A more appropriate definition of wealth for this intention, however, is “an abundance of those material or worldly things that men desire to possess”. That’s more like it. Nearly every word of that meaning is ‘loaded’. We won’t try, here, to put a figure on the amount of wealth in the world. The value of your house may have gone down, from 500,000 euro to 200,000 between 2007 and 2011, for example; but is once more, rising again. Your poor old car depreciates by about 20% a year; and if you had a few bob in sterling hidden away, then that would have risen dramatically after the Brexit vote. But, here we are, talking about a house, a car and some shillings, possessions which are at the apex of the average person’s ‘desire’, at least where wealth is concerned. With the income that he or she earns, that will be about the height of it all right, and if they can manage to hold on to it, they will pass it on to their children, other relatives or perhaps one of those charities we spoke about earlier. We haven’t referred yet to land or oil barons, luxury yachts and penthouses, big blocks of stocks and shares; and billionaires like Donald Trump. What are the chances of the poor, or even the average guy or gal, owning a fair share of the wealthy world? They are growing slimmer each year. Taking these figures and that of the world population mark for 2015 (7.3 billion), by means of a few simple, hopefully accurate calculations – e.g. 1% has 50%, so 99% share the remaining 50%, what we have tried to is to show just how much more a person in the wealthiest one per cent gets, than a person in the remaining 99% of the population. The result is a staggering 9,900 times more. So, whatever the value of the material or worldly things that you possess is, your ‘opposite number’ in the richest one percent has 9,900 times more than that. That is wealth inequality in its simplest form; and it is growing. The gap is getting larger between the 1% and the 99% because the wealthiest people have the means, the greater means – and perhaps the greater desire - to invest more, acquire more of the world’s actual and notional resources. This ‘blog’ has no idea just how accurate that figure of 9,900 is, but even if it was only half of that, or a tenth of it, the disparity would still be outrageous. It is of course, for the really poor, much worse than that. If you have nothing, as indeed many victims of wars and disasters experience, then 9,900 of nothing is still nothing. You won’t even have the will or perhaps the energy to engage with this exercise. We know one couple of our acquaintance who believe they can live on 5,000 euro a year. They are fortunate enough to own the place they live in, but they spend their entire year working ‘odd-jobs’; and relying on the kindness of neighbours. On the other hand, we ‘probably’ know people who are ‘millionaires’. Within that 99% there are mind-numbing variations; we have highlighted just a few. And pushing down on the 99, is the 1% above. The one per cent avoid depressions, or are not affected by them like the rest of us. For the people in that ‘bracket’ to continue to prosper, the remaining 99% must continue to fail. For example, we have been told that Ireland is recovering from the depression of 2008. Yet, nine years on, ‘savings’ institutions are only offering you .6 or .7% on your savings; and your government is taking a further 42% of that in tax. The property market has risen for the last two years; but the Central Bank has introduced strict mortgage regulations. Only those on the greater incomes; or with the greater savings or wealth will be in a comfortable position to buy. This is by no means an attack on those hard-working individuals and couples who strive for and need a bigger or better house to live in. It is just simply making the point that it is becoming more difficult, even in an improving economy, for average people in the business and private sector, to acquire ‘wealth’. Mark Carney, the governor of the Bank of England, states that the economists must acknowledge the uneven gains from trade and technology – as Bones would say, ‘I don’t know what that means’; but he may be referring to the astronomic advantages accruing to some from oil production and/or computerisation? Secondly, Mark Carney states that economies must be grown by rebalancing the mix of monetary policy, fiscal policy and structural reforms. ( Monetary policy involves changing the interest rate and influencing the money supply. Fiscal policy involves the government changing tax rates and levels of government spending to influence aggregate demand in the economy. Structural reforms could be anything from lowering/increasing petrol prices to openness and honesty in awarding government contracts). Finally, he said that there was a need to move towards more inclusive growth where everyone has a stake in globalisation. Globalisation is effectively opening up the world to people and governments. For example, you can go on the internet and buy a tray of artificial nuts from a Chinese supplier; or you can have your Waterford glass made in Czechoslovakia. But noting what the governor said about technology, surely those who have a stake in the internet will continue to reap uneven gains? Whatever way you read it, it is difficult to see how smaller and poorer countries can get more of the share, without the bigger countries taking less. Is that what the governor means? Any monetary policy is doomed to address the inequality without surely incorporating feelings for your fellow man, and not just the need to feed his or her desires for worldly goods. Somewhere in there, please, you must specifically legislate for the poor and the indigent, the displaced and the homeless. Perhaps Mark Carney is in some way paraphrasing what Pope Francis has stated? Pope Francis' 2013 apostolic exhortation on evangelization to the church, Evangelii Gaudium (The Joy of the Gospel) contains many themes dear to his heart. 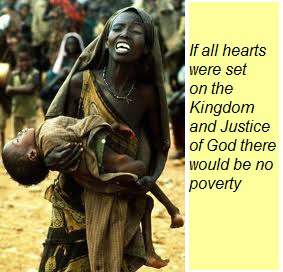 In the document, he challenges complacency at every level, including the obligations that Christians have to the poor. He exhorts the faithful to respond to the Gospel, to live it more fully and more deeply, to reach out to the poor and broken, to end injustice, to build peace. And to find the joy in all of it. 53. …How can it be that it is not a news item when an elderly homeless person dies of exposure, but it is news when the stock market loses two points? This is a case of exclusion. Can we continue to stand by when food is thrown away while people are starving? This is a case of inequality. The wealth of the few must make it difficult for them to live in the real world, to have solidarity with the poor. We are not condemning them. Pope Francis clearly states that protecting and increasing wealth is justified when it can better serve the common good. Governments and the powerful must adopt economic policies which accurately reflect the advantages accruing to the wealthier people and nations, and guarantee the fair distribution of goods and income, to banish hunger forever, something which Pope Francis and the Catholic church have set as a goal, by 2025.